GAINESVILLE, Fla-- "The crowd today was just amazing." It was standing room only at the Senior Recreation Center in Gainesville. Seniors and city leaders gathering around. One city commissioner even taking a seat on the floor for the unveiling of a project a year in the making. "We've moved from talk to implementation of a real plan and in the next few weeks, we'll begin really enrolling people and moving them from point A to point B which is really exciting," said Anthony Clarizio with Elder Care of Alachua County. Elder Care of Alachua County along with the city of Gainesville, and Gainesville Chamber of Commerce teamed up with the popular smartphone app, Uber. A partnership aimed at giving senior citizens some "freedom in motion". "We want seniors to maintain their independence and we just needed to figure out a way with Uber to make that happen. And I think we've done it with "Freedom in Motion"," said Uber Operations Manager, Tony Spadafino. "We want to help them get to and from the grocery store, to and from any kind of store that they need, in order to get the things that they need in order to maintain their lifestyle," said Clarizio. The 6-month pilot program was officially announced at the event. Serving seniors who live in the 400 building and Turkey Creek Forest neighborhoods. With funds from the city helping them get around town for a small co-pay of $0 to $5. Sam Ulbing says he's excited to get started. "The city is all spread out. You wanna go to Walmart, or you wanna go to a restaurant, you're gonna have to drive. And this will allow people to get out instead of sitting in their house," said Ulbing. Elder Care will even be offering classes making sure seniors know how to navigate the app. Helping them get out the door and on the road. "Once you learn how to use the smart phone, the Uber app will be a piece of cake," said Ulbing. "We've got some business partners already in place that are gonna provide us some loaner phones. The loaner phones will have the Uber app on it. It'll have 9-1-1," said Clarizio. Though the pilot program is starting small, Mayor Ed Braddy hopes it will soon take off. "I think our potential is limited only by our imagination," said Braddy. And as for Ulbing, he already has an idea of where he would take his first Uber ride. "I'd go to a restaurant so I can have that second drink and know that I don't have to drive home," joked Ulbing. 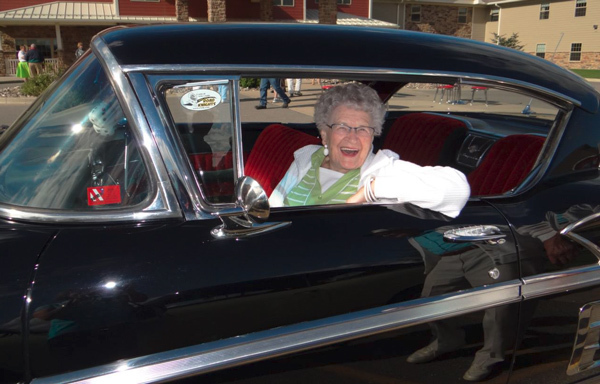 A responsible senior citizen who now has even more options to get around town.